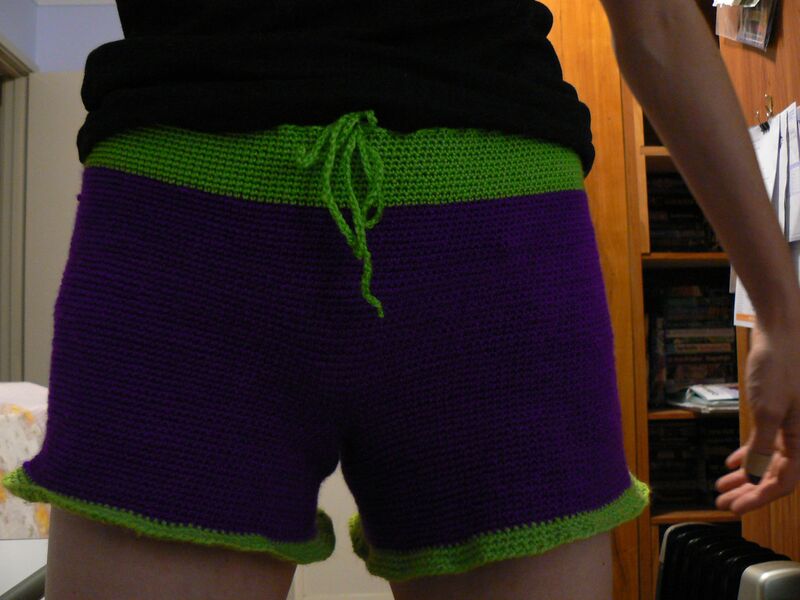 These shorts are made using a 3.5 mm hook and 8 ply wool. The pattern is written in American crochet notation. They are quite baggy with a drawstring. I made them for myself and I’m quite a small size. You can just adjust the dimensions to suit your size. Rounds 1 – 25: sc in each stitch (140 stitches) – you can do fewer or more rounds depending on the length of your legs and personal preferences. Rounds 26 – 65: sc in each stitch (220 stitches) You can do fewer or more rounds if you want, depending on how high you want the waist to be. Make a chain that is long enough to go around your waist with quite a bit of length to spare. Sew up the bit between the legs (the 30 stitches that were marked off by the pins). Thread the drawstring in and out through the final round of the waist.